The beauty blender is here to stay, it is one of the few products that has managed to stick around and for good reason. It is such a popular tool for professionals and novices alike, but at £16 a pop, or $20 if you live in the States, it can definitely add up. Hence, like any other popular product (cough silisponge cough) thousands of virtually identical products appeared in every brand known to mankind. I have tried a few sponges with different shapes and textures and if you are a believer in the beauty blender this is the sponge for you. 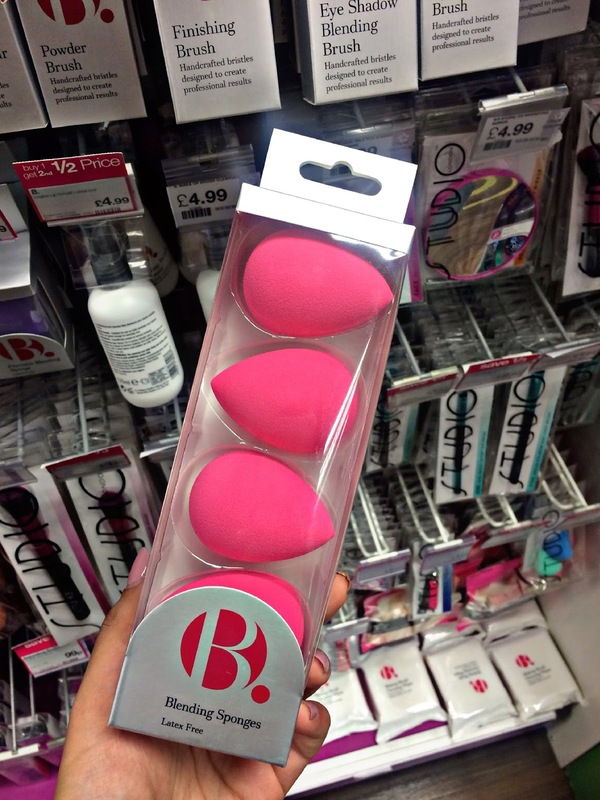 The B. Blending Sponge (£4.99) has the same shape, same colour, same texture and applies makeup just as well. It's latex free and considerably cheaper at just £5 per sponge or you can purchase this Pack of 4 (£14.99) pictured for an incredible £15! You can literally get 4 of these for less than one beauty blender. I know professional makeup artists that use this sponge over the beauty blender so this is always something I am happy to purchase. As most of you know, I am moving to London next month and as a true beauty addict as much as I will try to restrain myself I know I will cave and purchase products because I love trying out new things. Case in point: I am trying a brand new primer today and loving it. So I would love to know your favourite dupes or even just your holy grail budget products that are comparable to high end items. So please share in the comments, I hope to find some great beauty products that won't upset my bank account. Please follow me on Bloglovin', your support means everything to me. It is completely free and just helps you see when I have posted. No spam. I am going to be doing a giveaway very soon. I love eyeshadow palettes so I am keen to giveaway a palette, if you have any suggestions let me know in the comments and I will definitely take them on board. I hope you are having an amazing week. Check back for my August Favourites tomorrow. Take care. What are your favourite budget beauty discoveries? I'm still unsure about beauty blenders I have the orange real techniques on, I'm just rubbish at cleaning it I think that's the problem! I just use soap to clean it, it works okay for me, thank you for reading! My holy grail sponge is Real Technique Miracle Sponge and will forever repurchase it. That's an excellent price for a beauty blender! I wonder if than brand is in the states! I haven't heard much about this brand, but that's a pretty good deal! I wonder if we have it here in Canada! My favourite budget sponge is the one from BasicBeautyTools! Wow, you are going to have so many wonderful adventures ahead of you in London! I think the beauty blender is such an amazing product, I finally started using one just this month (I know, I am so late) and it's changed my make up game for sure!